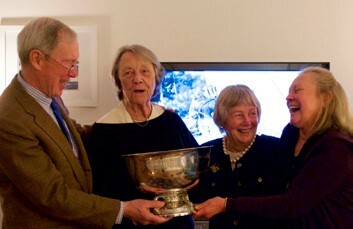 Betsy & Hunt Lawrence of New York, NY received the prestigious Nathanael G. Herreshoff Trophy for their outstanding contributions to the sport of sailing. The Lawrences were instrumental in their financial support for the fleet of Olympic-class boats that were used at the Olympic venue in Rio de Janeiro, Brazil for more than two years to help train American athletes. The Lawrences also founded Oakcliff Sailing, a high performance training center in Oyster Bay. Oakcliff was named a US Sailing Team National Training Center in 2013, and acquired multiple fleets of Olympic-class boats that were used for training and racing in Oyster Bay and around the world. One of three recipients of national coaching awards presented annually by US Sailing’s Olympic Sailing Committee (OSC), Peter Becker of Rye, NY is the 2016 Volunteer Coach of the Year. After helping to start and manage the Young American Junior Big Boat Sailing Team at American Yacht Club in Rye, NY, Becker saw years of effort come together when his predominantly junior crew on the Tripp 41 High Noon found unprecedented success in the 2016 Newport Bermuda Race. High Noon was the second boat in the 133-strong fleet to arrive in Bermuda, beaten only by the 100-foot super maxi Comanche. The team took third overall in the St. David’s Lighthouse Division, winning the race’s first Stephens Brothers Youth Division Trophy. Don Rotzien of New York, NY received the award for Excellence in Instruction. As the Program Growth and Development Officer at Hudson River Community Sailing, Rotzien aims to develop programs and students by identifying their inherent potential and guiding them to achieve it. Whether he’s directing an adaptive sailing program or rigging a spinnaker simulator from a thin plastic bag and wooden dowels when high school students are forced inside during a rainstorm, Rotzien has the remarkable ability to teach the most complex sailing topics. New England Science & Sailing (NESS) in Stonington, CT received the award for Creative Innovations in Programming. NESS provides students of all ages with year-round programming that includes marine science, sailing, powerboating, and adventure sports. NESS courses support STEM (science, technology, engineering, and math) curriculum with a unique combination of on-the-water and classroom lessons intended to spark curiosity, enhance learning, and encourage students to step out of their comfort zones. Spike Lobdell of Stonington, CT received the award for Outstanding Organizational Leader. The founder and President/CEO of the New England Science & Sailing Foundation (NESS), Lobdell works selflessly and tirelessly to make sailing accessible to all who want to learn. He firmly believes that benefits derived from sailing – increased self-confidence, teamwork, leadership, independence and resilience, to name a few – should be available to everyone. Dana Bolton of Burlington, VT was named Volunteer of the Year for his ongoing dedication to the Community Sailing Center (CSC) on Lake Champlain. Bolton has volunteered at CSC for four years in addition to being a summer staff member. He donates his time, all winter, to updating curriculum, recruiting new staff at various boat clubs and yacht clubs so CSC can attract more adult instructors and implement new programs. He’s also donated his J/88 to the CSC Junior Big Boat Program. Mary Horrigan of New London, CT received the award for Outstanding Community Sailing Program Director. Horrigan is recognized for her leadership in bringing the sailing, STEM education, ocean stewardship and outreach at NESS to students in New London. She has provided access to sailing for these kids, spearheading NESS’s partnership programs with numerous community organizations in New London and the New London Public Schools. Through her encouragement and tireless efforts, over 1,000 students went sailing during the 2015-16 school year and the summer of 2016. For more information, visit ussailing.org.